We like to thank our best clients, so with your qualifying purchase you will receive this patriotic light up 2-port wall charger! 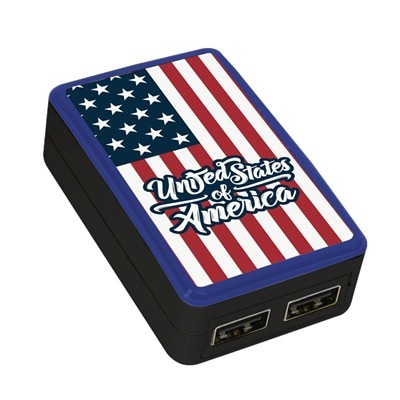 It features a dual port charger allowing up to two devices to charge at once, a colored glowing trim ring and a splendid American flag graphic perfect for spreading some American pride. It is small, compact, efficient and has folding prongs for easy storage. Great for traveling or keeping around the house. Please enjoy your gift!